Erik Brannstrom hadn't heard any rumblings ahead of the NHL trade deadline. A first-round pick of the Vegas Golden Knights, the 19-year-old was monitoring the trickle of moves as 3 p.m. ET on Feb. 25 approached when that all changed. "I saw my name come up," Brannstrom recalled. "A buddy texted me five minutes before the deadline and then my agent called five minutes after." By that time, the deal was done — the smooth-skating defenceman would be the main piece heading to the Ottawa Senators in a swap that saw Vegas get star winger Mark Stone. "I was a little bit surprised, but I'm really glad," Brannstrom added. "We're trying to build something." The native of Eksjo, Sweden, is viewed as a key element to last-place Ottawa's future in the wake of the franchise's decision to tear its roster down to the studs and start over. 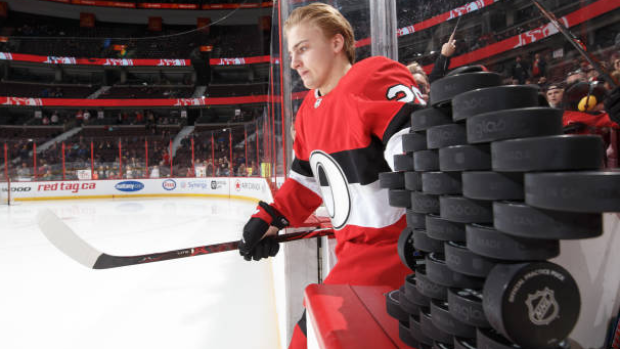 Stone, centre Matt Duchene, winger Ryan Dzingel were dealt before the deadline, while captain and defenceman Erik Karlsson was shipped out of town in September. Ottawa is pinning its hopes on prospects like Brannstrom. "My words and maybe my actions can't begin to show how elated I am," Senators general manager Pierre Dorion told reporters after the trade. Fans in the nation's capital got a glimpse of their new talent sooner than expected when Brannstrom was recalled from Belleville of the American Hockey League on an emergency basis last week with Senators defencemen Thomas Chabot and Christian Jaros injured, and Mark Borowiecki out sick. Brannstrom finished his NHL debut with over 17 minutes of ice time and was on for one of his team's two goals in a surprising 2-0 victory over the St. Louis Blues. "It was pretty fun to be up there and see how it is," Brannstrom said. "It was a good opportunity. I didn't expect it. "I was really nervous to meet everybody. I was nervous at the start of the game, but it got better and better." Brannstrom got another call to the NHL on Thursday before Ottawa's game in Calgary against the Flames. The five-foot-10, 173-pound Brannstrom had 28 points (seven goals, 21 assists) in 41 games with the Knights' AHL affiliate in Chicago this season — his first playing in North America — before joining Belleville, where he has four assists in eight games. He had a breakout performance Saturday, his third game in three days, collecting three assists for Belleville in a 6-5 shootout win over Laval. "I feel a little bit more confident," Brannstrom said. "I think I played well up there and everything (against the Blues). "I'm just trying to play my game and do what I'm good at." According to Belleville head coach Troy Mann, those attributes are numerous for the 15th overall pick in the 2017 draft. "He's going to be dynamic — his vision, his lateral movement, his skating ability," Mann said. "Like any 19-year-old, there's plenty of things he needs to work on. He's still getting acclimated. "As he grows and matures and becomes stronger and turns into a man, he's going to be a dynamic player." Brannstrom scored four goals in five games for his country at this year's world junior championship, demonstrating a quick release that's key for a modern NHL defenceman. "You don't need the big clapper anymore," Mann said. "You've just got to have that vision to put pucks through. There's so much fronting (of shooters), there's so much blocking. "When you look at the goalie there's usually multiple bodies in front. Defencemen have to learn to move laterally and get that puck through." Belleville captain Erik Burgdoerfer, who has been paired with Brannstrom at times, said the youngster's drive also sets him apart. "People might say he's a smaller guy, but you watch him out there and his work ethic and his compete is very high," Burgdoerfer said. "Obviously he has the skill and the poise and the passing and play-making ability, but a lot of times those guys lack the compete and the will to win one-on-one battles. You don't see that with him. Focused at the moment on helping get Belleville into the playoffs, Brannstrom also feels a lot closer to the NHL with rebuilding Ottawa than he did buried in the farm system of a Stanley Cup contender. "It was more far away in Vegas because there were many defenceman and veterans ahead of me," he said. "We have a younger team with the Senators. "It's a good opportunity to get to the NHL."